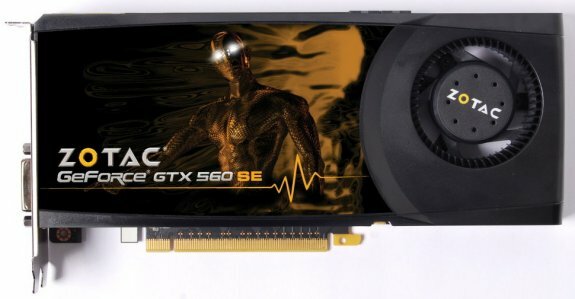 Zotac rolls out a GeForce GTX 560 SE. This card features 288 shaders, a 192-bit memory bus, a 746MHZ core, 1492MHz shaders and 1GB GDDR5 memory clocked at 3828MHz. Display outputs include Dual-DVI, HDMI and DisplayPort. ZOTAC® International, a global innovator of graphics cards, mainboards and mini-PCs, today announces the GeForce® GTX 560 SE. The new ZOTAC® GeForce® GTX 560 SE gives gamers a taste of stunning 1080p gaming on a budget. “1080p resolution displays and Microsoft® DirectX® 11-enabled titles are affordable and become quite popular among gamers. Our new ZOTAC® GeForce® GTX 560 SE provides an excellent value for gamers that want to get their feet wet with 1080p and DirectX® 11 gaming,” said Carsten Berger, marketing director, ZOTAC International. Packing 288 unified shaders and 1GB of video memory, the ZOTAC® GeForce® GTX 560 SE shreds through the latest Microsoft® DirectX® 11 titles with blazing-fast frame rates and dazzling eye-candy for an out-of-this world gaming experience on a budget. It’s time to game with the ZOTAC® GeForce® GTX 560 SE.